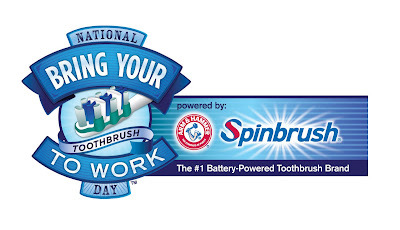 Think about how much you eat and drink during the day, and then how many people you interactive with at work...don't you think you should be brushing your teeth during the day? A recent survey by ARM & HAMMER Spinbrush toothbrushes found that less than half of Americans keep a toothbrush at the office, and those who do keep a toothbrush in their desk drawer, a quarter of them don't use it regularly. To help encourage more brushing of teeth in the office washroom, ARM & HAMMER Spinbrush has dclared Thursday, April 29, 2010 as national "Bring Your Toothbrush to Work Day." Enter to win a ARM & HAMMER Spinbrush toiletry set! This giveaway is open to US residents only. The contest will end on Sunday, May 2nd. I will randomly select FOUR lucky winners and announce them on Lipgloss Break, so keep checking to see if you're a winner - Good Luck!